Do Birkenstock's take you back to your younger days? They used to be so cool and after a bit of a hiatus they are back and even cooler than ever. Being a flat, simple slip-on sandal we generally pair these up with a casual day look or wear them to the beach. With Birkenstock's returning with a bit of flare I wanted to push the norm and see how dressed up I could style them. If you caught my last blog post you will know Shoeme.ca is challenging the rules of how to wear shoes. Wednesday I started with espadrilles and today I'm pairing up my rose gold Birks with this simple yet pretty slip dress. I would feel totally comfortable taking this look out for dinner. The white dress is almost too fancy so toning it down a bit with a denim jacket can really bring balance to this dressed up/ dressed down look. How are you wearing your Birks? When I think about espadrilles beachy, vacation vibes come to mind. Usually made with a canvas shell and jute rope sole they are designed with comfort and for casual settings. Recently I was asked by SHOEme.ca to challenge the rules of shoes for their #MADETOBEBROKEN campaign. Since I'm not one for rules anyway I was excited to take on the job. So meet Leni, an espadrille from Circus by Sam Edelman. 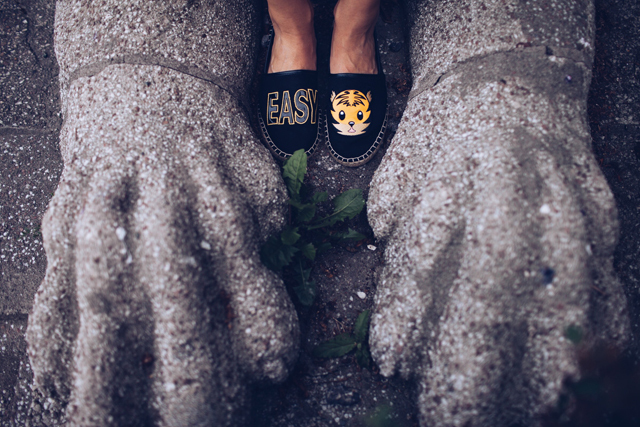 They are too adorable with the word EASY on one shoe and an emoji of a tiger on the other. They were tough to choose between the other two available on SHOEme which were: Rosé ALL DAY and Fries (emoji) B4 GUYS. Anyway, I really wanted to challenge that casual mentality when wearing this shoe so I went ahead and dressed them up. 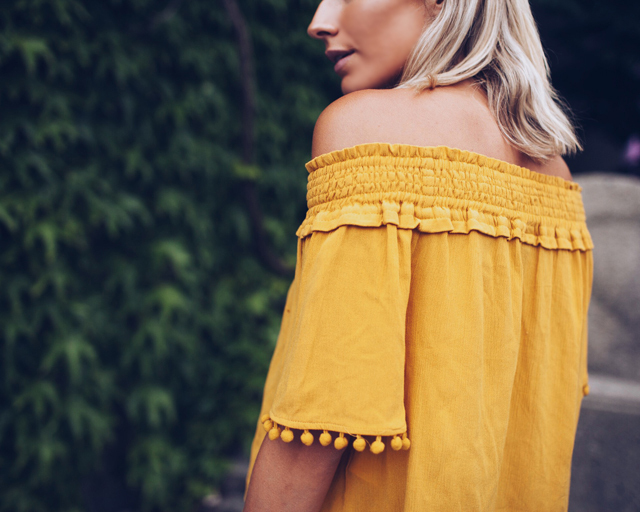 The cheeky little message called for leather and the adorableness of it all made me do something off the shoulder. In the end I think I pretty much nailed it. I mean, with shoes this cute there isn't much to hate on no matter what you wear. What do you think? Would you attempt to style espadrilles dressed up or do you prefer to keep it casual?